Many say that goldfish are the traditional first pet fish with records dating back 500 to 2,000 years. However, when you are talking about the first species of fish displayed in aquariums in the mid-1800s, paradise fish were responsible for launching the tropical fish-keeping hobby. This fish is still among the most glamorous specimens found in the freshwater aquarium hobby. This species is found across a considerably wide range of southeast Asia. In China, it is found from the east in the Yangtze river basin to the Pearl River basin, in Hong Kong, and on Hainan Island. It also occurs in Taiwan, northern and central Vietnam, northeastern Laos, Cambodia, Malaysia, Japan, the Ryukyu Islands, and Korea. it has also been introduced outside of its native range with populations found in Madagascar and the United States. There has been a lot of debate and much written in scientific and hobby journals about the paradise fish; whether or not the fish in hobbyist tanks today is the same as the one that exists in the wild or if it was modified by breeders over the years. Though data is inconclusive, on the whole, it seems that the common variety of the fish we know in tanks today is much the same as the fish that is wild in the rice fields in Asia. There are three species of paradise fish that are commonly kept in the aquarium. They look very similar and are distinguished by the shapes of their tails. Macropodus opercularis has a forked tail, Macropodus chinensis has a rounded tail, and Macropodus cupanus has a pointed tail with several rays extending from its middle. All three species are banded with stripes of vivid color, which varies according to the angle of the light falling upon it, and is intensified during courtship. These bands are blue or green alternating with orange or red. There are also numerous small dots of black or metallic blue scattered over the body of the fish. In all three, the ventral fins are orange. There are two genetically engineered varieties. There is an albino variety, called the albino macropodus, which was engineered by a commercial breeder in Germany in 1933. It has pink eyes and creamy white, pink, and blue stripes, and there is a darker variety called the “concolor” variety. Paradise fish are not good tank mates with fish their size, in fact, they are downright nasty, they rip tails and sometimes kill other smaller fish. They really prefer to live alone, but will accept some other species of fish as long as they are larger and non-aggressive. Similar to bettas in disposition, they are belligerent and predatory. In a community setting, this fish needs to be the dominant species and should not be kept with other robust fish that may compete for control. It will fight with other dominant fish, or if the others are larger and aggressive it will hide, and often succumb to stress. Some people believe this fish will peacefully share a bowl with a betta, but there is no truth to this and can lead to disaster. Young paradise fish can be kept in groups, but as they mature the males become combative with other males and any small fish can become a snack. Males generally do not get along together unless the tank is very large with lots of decor for hiding and retreat. Males should be kept apart or they will engage in aggressive combat, locking jaws, and damaging one another. If keeping a small group, it is best to keep them as a male and female pair in their own tank, or you can try to keep a group of females together. A mix of neutral personalities of fish that are not similar in looks is the ideal goal for its range of tank mates. Be careful in selections, and be prepared to adjust companions if needed. Good tankmates can be larger fish such as goldfish as well as non-aggressive medium to large gouramis, robust cyprinid species, larger characins, eartheater type Geophagus cichlids, loricariid catfish from South America, large Synodontis catfish, and loaches. Avoid slow swimming fish or fish with long flowing fins. 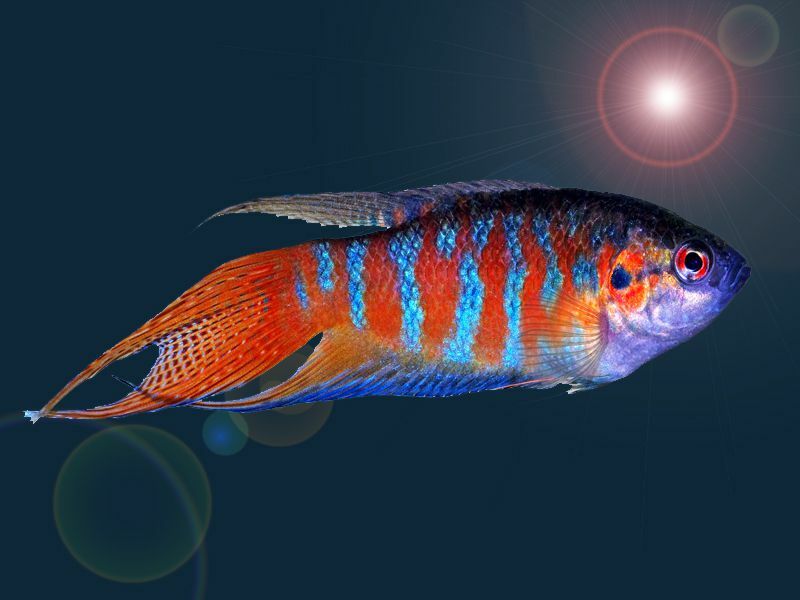 The paradise fish is very adaptable and can adjust to almost any water condition. The size of the aquarium should be at least 20 gallons. On the opposite end of the spectrum, your aquarium can be a 5000-gallon backyard pond full of koi. These fish can handle a wide variety of temperature fluctuations. Paradise fish love to eat. As omnivores, the paradise fish will accept most foods. However, they require a well-balanced diet to remain healthy. In the wild, they are predators, feeding on small fish and small aquatic animals like planktonic invertebrates and other zoobenthos. In a pond, they will greedily eat mosquito larva or anything that happens to fall in the pond. In an aquarium, feed often and generously, some live but dry food is accepted. Live plants are a must in whatever environment you place them in. Algae-based flake foods are essential, as well as meaty foods. Feed them small live foods when possible. Supplementation should include white worms, blood worms, brine shrimp, or any other suitable substitute. Generally feed once or twice a day. They enjoy exercising their predatory nature on live foods, but should also be provided with some vegetable matter. Males are larger than females and are brighter with stronger color patterns. Their fins are also longer and larger. Prior to spawning, they should be well conditioned in a separate environment with small offerings of live and frozen foods several times a day. When well fed, females should begin filling out with eggs, appearing very plump. Females not yet ready for egg-laying should be kept away as males have a nasty temperament and may mutilate or even kill an unprepared female. Like most fish in the labyrinth fish family, paradise fish are bubble nest builders and breeding this species is not difficult. The male builds a bubble nest, woos a female, then defends the nest to the death. Males build the nests frequently beneath a leaf. After spawning, the female should be removed from the tank or you risk the female being killed by the male. When you are ready to breed, you will need an individual breeding tank about 20 gallons in size. It should be set up with the water level low at about 6 to 8 inches. Normal water parameters are fine but raise the temperature to between 80 to 84 F. You can add a small gently air-powered sponge filter or some peat filtration, but the tank current should be minimal. Hatching time varies with temperature. Generally, the fry will emerge between 30 to 50 hours, but it could be between 48 to 96 hours. After hatching, the male should be removed or he might eat the fry that emerge from the nest.